2.1 What are the ICD-10 codes for reticular varicose veins? 2.2 What are visual photos of reticular varicosity? 2.3 Is reticular varicose veins of the lower limbs dangerous? 2.4 Are natural childbirths possible with reticular varicose veins? 2.5 When should I see a doctor? 2.6 Reticular varicose veins: who cured? 2.7 What is the treatment of reticular varicose veins? Varicose veins, or varicose veins, are characterized by dilated superficial veins, most often on the lower limbs.Additionally, venous valve insufficiency and circulatory disorders are determined. Pathology is characterized by the identification of tubercles and nodules along the venous network, and the vessels themselves are often thickened and bent. Varicose veins are dangerous due to their unceasing progression, especially in the absence of adequate treatment. Depending on the caliber of the affected vessels, there are varicose veins, arachnid and reticular varices. For a reliable diagnosis of the disease, the patient should visit a phlebologist, who, if necessary, conducts an ultrasound of the vessels. Treatment may consist in the use of venotonic agents, in extreme cases, laser therapy is performed. As a rule, when treating veins in the early stages of the disease, the prognosis is favorable. Reticular varicose veins are the definition on the skin of small, blue or green, dilated veins with a diameter of 1-3 mm in areas such as the legs and face. These veins are usually smaller than varicose veins, but larger than spider veins.The reticular veins look flatter and less twisted. When there is a connection between the reticular veins and spider veins, they are called “feeding” veins. 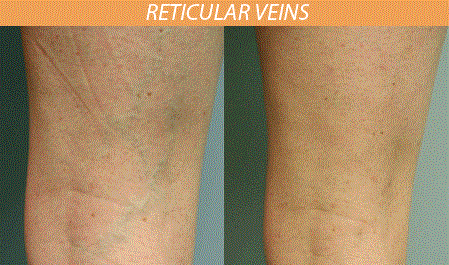 Like spider-like and varicose veins, reticular veins are caused by weak or damaged venous valves. Blood can accumulate in the affected area and lead to the expansion of the veins and their subsequent appearance under the skin. Additionally, there are two more types of varicose veins - spider-like or spider veins, and varicose veins. Spider veins , also known as telangiectasias, are small vessels (less than 1 mm) that can be seen on the surface of the skin. In form, they resemble tree branches with short jagged lines or spider species. This is perhaps the softest form of varicose veins, differing in appearance, from pink, red to bluish-purple. Spider veins are found in approximately 10–25% of the total adult population. 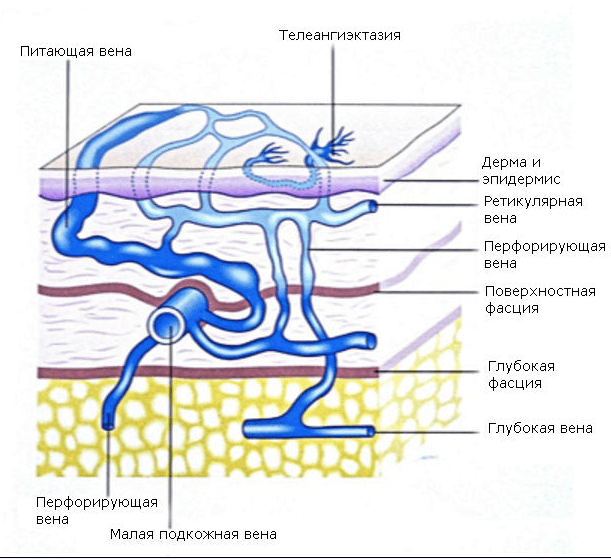 This pathology is the result of stretching the veins closer to the surface of the skin. As the veins increase due to the effect of ambient pressure, they can retain more blood and often become noticeable in highly congested parts of the body (in the calf, thigh, face). General discomfort in the affected area. Varicose veins - dilated venous vessels with a diameter of more than 3 mm, which appear under the skin like a bunch of grapes. Veins can be purple and blue, are found in various areas throughout the body, but are most often defined on the hips, legs, ankles. 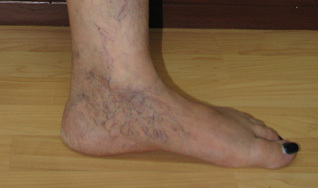 Varicose veins may protrude above the surface of the skin. Like the spider-like and reticular veins, varicose veins are the result of stagnant blood in the venous system of the lower limbs due to ineffective circulation. Venous blood creates pressure on the surrounding tissue and contributes to the development of inflammation in the veins. This is what leads to pain, itching, burning, and cramps. When the blood flow through the vessels is interrupted, there is pressure on the veins, which can lead to swelling of a part or the entire limb, especially the ankles. It is the result of fluid accumulation in one or both legs. Pressure in the veins can lead to symptoms characteristic of the disease, such as a feeling of heaviness or pressure in the legs, and general discomfort. These signs can be eliminated by lifting legs or using compression stockings or pantyhose. As varicose veins develop, swelling and pressure increase, which can cause the skin of the legs to lose its normal structure. In particular, the skin becomes pigmented, dry and rough when touched (lipodermatosclerosis). Inflammation can lead to pain and significant discomfort, indicating serious venous insufficiency. 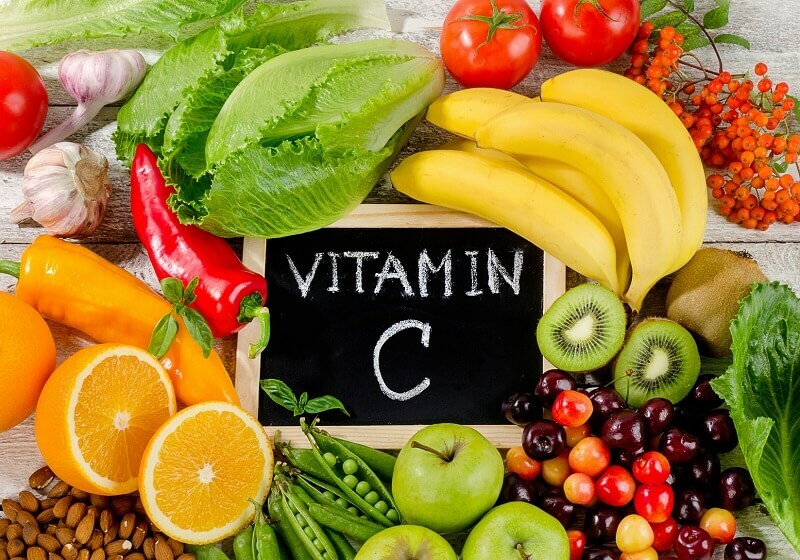 Without treatment for varicose veins, increased swelling and inflammation of the skin due to poor circulation can lead to serious complications. The skin may begin to crack, which contributes to the formation of an open wound, requiring urgent medical treatment. 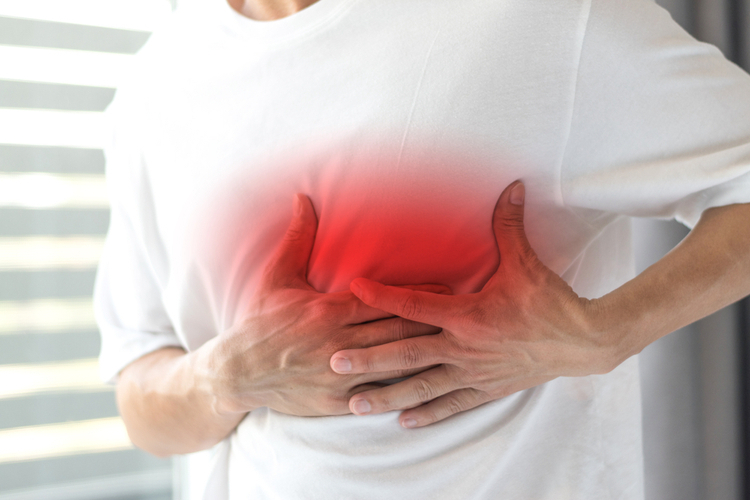 An open ulcer contributes to the ingestion of various bacteria from the air and on contact, which penetrate deep into the wound and thus worsen the patient's condition. Most venous ulcers occur above the ankles and can be cured slowly. They are often accompanied by pain in the legs, discoloration of the skin and the formation of new ulcers that leak out with pus and give off a bad smell when the infection is added. Normal, healthy veins have one-way valves that prevent backflow of blood moving to the heart. If the valves are not working properly in the superficial veins of the legs, blood can accumulate in the lower limbs. Blood stasis in the venous system leads to an increase in internal pressure and swelling, which can cause an increased blue, red or flesh-colored vein, which is often well visible through the skin. Over time, this pathological condition is aggravated by other changes in the texture of the skin and, ultimately, leads to the formation of leg ulcers, which must be treated properly. Long standing, pregnancy, obesity, stress, injury, heredity, or age can contribute to the development and progression of varicose veins. There are many risk factors that can predispose a person to the development of reticular varicose veins and other forms of varicose veins. Familial predisposition to varicose veins is most common and crucial because venous diseases are inherited pathologies. With injuries and injuries, the structure of the veins can be disrupted, making it difficult to move blood through them. Gender can have an important role, since it is noted that women are twice as likely to have varicose veins than men. Medications used to prevent pregnancy or to treat infertility can increase the amount of hormones like estrogen and progesterone, which increase the risks of vascular damage, including veins. During pregnancy, pressure on the pelvic organs and veins is most often exerted, which leads to spider-like and reticular varicosity with further varicose veins. Prolonged standing or prolonged immobility may increase the pressure on the veins. Reticular varicose veins, like varicose veins, is a progressive condition that can begin from mild to severe symptoms.Over time, mild or even severe symptoms may occur, such as heaviness, pain, swelling, fatigue and itching. A similar condition in severe cases leads to ulceration of the legs. Clinical - describe the physical appearance of the affected veins. Etiological - hereditary factors are determined. Anatomical - identify the degree of involvement of veins in the pathological process. Pathophysiological - assess the direction of blood flow. What are the ICD-10 codes for reticular varicose veins? According to the International Classification of Diseases 10 Revision (ICD-10), the main code assigned to a disease such as varicose veins of the lower extremities is I83 . There are also clarifying codes that can, if necessary, be affixed to the diagnosis. Varicose legs with ulcers (I83.0). Varicose legs with inflammation (I83.1). Varicose veins with ulcer and inflammation (I83.2). The last subcode (I83.9) is phlebectasia of the legs, including without specified localization. What are visual photos of reticular varicosity? 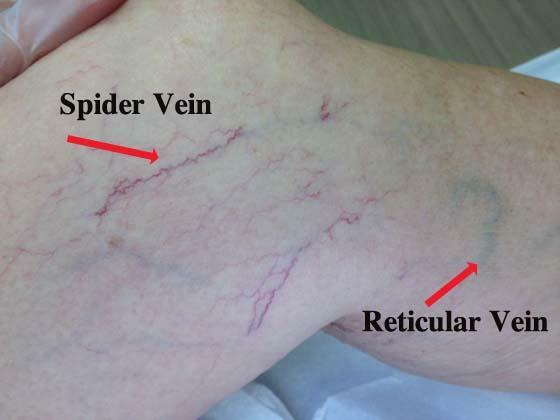 Reticular veins are most often confused with arachnids, or so-called spider veins. That is why it is useful to look at the photo to understand the existing difference. The photo shows arrows spiders-veins (purple and thin), as well as reticular veins (green and larger diameter). Reticular varicose veins may occur on the thighs and legs, as can be seen in the above photo. Sometimes reticular varicose veins develops in the ankles, and then swelling of tissues can occur rather quickly. Is reticular varicose veins of the lower limbs dangerous? At first glance, reticular varicose veins are not dangerous diseases, since quite often when it appears, there are even no subjective complaints. But according to doctors, the definition of reticular varices may indicate latent venous insufficiency. This disease is much more serious and is considered really dangerous, so do not ignore the first signs of reticular varicose veins. Are natural childbirths possible with reticular varicose veins? Reticular varicose veins is considered a reversible form of the disease, so even with the upcoming delivery and the absence of symptoms, such as leg edema, etc., it is possible to quite successfully give birth to a healthy baby with independent forces. The only thing is that during pregnancy you may need to follow the recommendations of the doctor for the conservative treatment of varicose veins, which will help you feel good after giving birth. If self-help methods such as exercise, raising the legs while sitting and / or wearing compression stockings did not give the desired result and / or have a desire to improve the condition of the venous vessels purely cosmetically, you should make an appointment with a phlebologist to discuss the most appropriate treatment. It is important to immediately seek medical attention if you have leg ulcers or other non-healing wounds. Reticular varicose veins: who cured? This question often interests people who are just faced with their problem. In fact, varicose veins are most effectively treated in the early stages of development, when the vessels have just begun to appear, and the symptoms are not very pronounced. 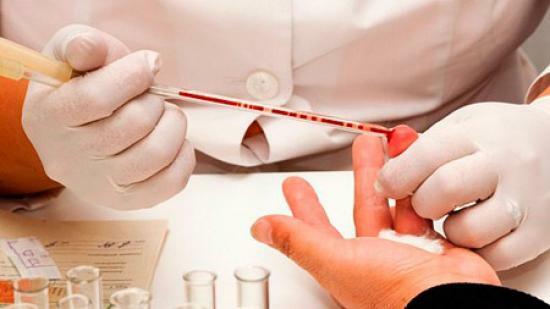 In such cases, it is enough to undergo an examination by a phlebologist and undergo treatment with prescribed drugs in order to improve the condition. In the morning, before lowering the legs out of bed, you need to do some simple exercises for the legs like scissors, a bicycle. Feet should be placed vertically, holding them against the wall and in this position are up to 10 minutes. Then, without lowering the legs, wear compression underwear. If purely mechanical legs were left out of bed, then it is better in this case not to wear stockings, so as not to cause harm instead of benefit. What is the treatment of reticular varicose veins? Superficial sclerotherapy remains the gold standard in the treatment of spider-shaped and reticular varicose veins. To carry it out, a very thin needle is injected with a solution (sclerosant) directly into the affected veins. 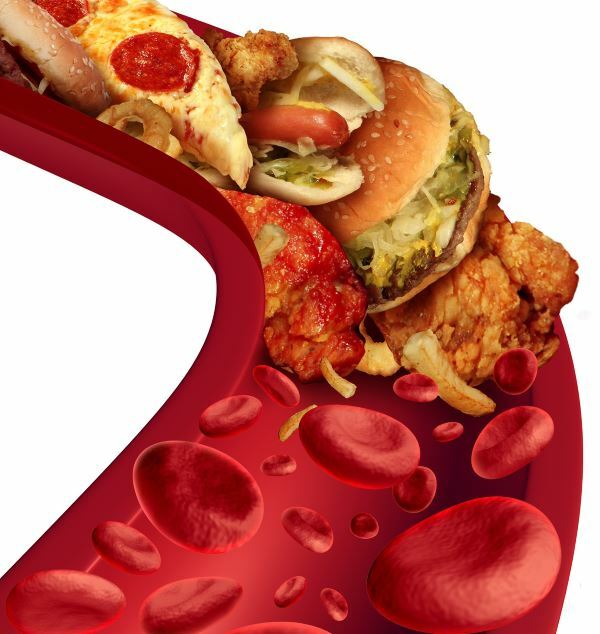 Under the action of a substance, an inflammatory reaction begins, which causes the veins to swell and eventually the blood vessel is sclerosed. For such a vein, the blood flow stops. New drugs to perform sclerotherapy significantly reduce pain, inflammation and discomfort after the procedure. Yet similar symptoms often occur after treatment of superficial veins. Also in some modern clinics they use visually controlled LED technology to obtain the most accurate image in order to achieve the desired clinical results.